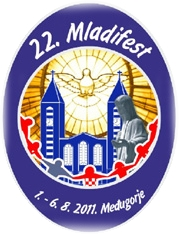 Greetings to Medjugorje. On today's feast of St. John Vianny Cure of Ars, I ask Our lady and him for intercession that take with this youth festival, many young people about Jesus in his ministry can be to be witnesses of his love and healing, as spouses and parents, as priests and religious Christians. I'm definitely with you wholeheartedly and look forward to the many graces which Our Lady is giving these days. Laura Carbarelo from Argentina, married for 2 years to an Italian. Medjugorje has transformed her life. It has changed after a visit to Medjugorje. She started to pray, to read the Bible and to fast. Marguerite Peeters from Belgium. Was a journalist and is now active in a Christian community. Svetozar Kraljevic. Director of Mother's Village. Boys of the Community of the Merciful Father bear witness to their lives. Alfred Ofner from Austria, a former firefighter. Got to know about Medjugorje in 1984. His vocation and physical healing are related to Medjugorje. He is currently in training to become a deacon. Deanna Joy is English England School of Evangelism. About 40,000 people worldwide were connected via the Internet with Medjugorje, 501 concelebrating priests stood at the altar, and many other priests donated the sacrament of penance. 463 priests concelebrated the Holy Mass.More than 46,000 people worldwide were connected to Medjugorje over the Internet. Gabriele Kuby from Deutschlandist is the author talks about her experience and her encounter with God "Medjugorje is for me a very special place of repentance"
Draga Vidovic a guide from Medjugorje. Was 15 at the time of the apparitions in Medjugorje. She has written a book about Medjugorje. 499 priests concelebrating donated many more to confession.